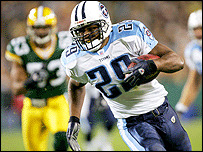 The Titans found themselves needing an experienced running back when LenDale White, the 45th-pick overall in 2005, came into the offseason program overweight. The former Southern California running back has struggled with a hamstring problem and spent several days in minicamps working on rehab on the sidelines. Brown started three of the first four games in 2006 and wound up playing only in five. He rushed 41 times for 156 yards with his best game coming at Houston on Dec. 10 when he averaged 11 yards on four carries. The deal includes performance incentives for the four-year veteran who has 2,295 yards rushing in his career, 10th all-time in team history. He was a third-round draft pick out of Colorado in 2003. Brown, who was in Nashville on Monday helping hand out free shoes at a homeless shelter, could be signed and take part in the Titans’ final minicamp starting Tuesday.